On the limit of aircraft and spacecraft, the X-15 reached Mach 6.72 and an height of 107960 m. The X-15 was designed to resist the heat and friction of atmospheric reentry. It was powered by rocket engines. The X-15A-2 version could carry two large external fuel tanks. Three X-15s were built, one was lost in a fatal accident. During the X-15 program, 13 flights met the US criterion for a spaceflight by passing an altitude of 50 miles (80 km) and the pilots were accordingly awarded astronaut status by the USAF. Out of these, 2 also qualified for the international FAI definition of a spaceflight by passing the 62.1 miles (100 km) mark. As with many of the X-aircraft, the X-15 was designed to be carried aloft under the wing of a B-52. The fuselage was long and cylindrical, with fairings towards the rear giving it a flattened look, and it had thick wedge-shaped dorsal and ventral fins. The retractable landing gear consisted of a nose wheel and two skids to provide sufficient clearance part of the ventral fin had to be jettisoned before landing. The two XLR-11 rocket engines of the initial model X-15A delivered 36 kN (8,000 lbf) of thrust; the "real" engine that came later was a single XLR-99 that delivered 254 kN (57,000 lbf) at sea level, and 311 kN (70,000 lbf) at peak altitude. Twelve test pilots flew the plane, including Neil Armstrong, later the first man on the Moon and Joe Engle who went on to command Space Shuttle missions. In July and August, 1963, pilot Joe Walker crossed the 100 km altitude mark twice, becoming the first person to enter space twice. Test pilot Michael J. Adams was killed on November 15, 1967 when his X-15-3 began to spin on descent and then disintegrated when the acceleration reached 15 g (147 m/s²), scattering wreckage over 50 square miles. On June 8, 2004 a memorial monument was erected at the location of cockpit crash site near Randsburg, California. Michael Adams was posthumously awarded astronaut wings for his last flight in the X-15-3, which had attained an altitude of 266,000 feet (81.1 Km). In 1991 Adams' name was added to the Astronaut Memorial at the Kennedy Space Center in Florida. The second X-15A was rebuilt after a landing accident. It was lengthened by about 0.74 m (2.4 ft), received a pair of auxiliary fuel tanks slung under the fuselage, and was given a heat-resistant surface treatment, the result being called the X-15A-2. It first flew June 28, 1964, and eventually reached a speed of 7,274 km/h (4,520 mi/h or 2,021 m/s). The altitudes attained by the X-15 remained unsurpassed by any piloted aircraft except the Space Shuttle until the 3rd spaceflight of SpaceShipOne in 2004. The speeds and altitudes have, also, frequently been exceeded by unpiloted air-launched rockets, such as the Pegasus rocket which has carried several satellites all the way into orbit. The widely reported record achieved by the diminutive X-43A scramjet testbed on November 16, 2004 of nearly Mach 10 (10,621 km/h or 2.95 km/s) at 95,000 ft (29 km) is only a record for an air-breathing jet engine. The 1950s was definitely the decade of speed as far as U.S. aeronautical research was concerned the U.S. Air Force and the National Advisory Committee for Aeronautics (NACA) were convinced that the key to dominating the skies was to fly faster than the opponent. The X-1 experimental aircraft broke the sound barrier in 1947. The Navy D-558-II ("D-558 Dash Two") reached Mach 2 on November 20, 1953. Soon other aircraft were reaching Mach 2.44 (1,650 miles per hour, or 2,655 kilometers per hour) and Mach 3.196 (2,094 miles per hour, or 3,370 kilometers per hour). These high speeds presented new challenges to aircraft designers. People who study how air moves around an aircraft are called aerodynamicists. Although one of their most useful tools for decades was the wind tunnel, they could not always provide the kind of data that they needed. By the 1950s, there was virtually no way to simulate with a wind tunnel how air flowed around an aircraft at many times the speed of sound. Aerodynamicists had theoretical models (in this case a "model" is a set of equations that predict how certain shapes will act at certain airspeeds), but in order to confirm the models, they would have to actually fly an aircraft at that speed. In 1952, the NACA established a goal of conducting research on aircraft capable of flying at speeds between Mach 4 and Mach 10 and at altitudes between 12 and 50 miles (19 and 80 kilometers). This speed range was called "hypersonic." On September 30, 1955, North American Aviation was awarded a contract to develop an aircraft to conduct this research. The aircraft was designated the X-15. The X-15 developed numerous technologies associated with high-speed flight. These technologies were later incorporated into aviation, missile, and space programs. Of all the X-plane programs (and there have been dozens), the X-15 is generally considered the most successful because it flew the longest and greatly expanded the boundaries of flight research. The X-15 had a long fuselage with short stubby wings and an unusual tail configuration. A Reaction Motors, Inc. XLR99 rocket engine generating 57,000 pounds (253,549 newtons) of thrust powered the aircraft. This engine used ammonia and liquid oxygen for propellant and hydrogen peroxide to drive the high-speed turbopump that pumped fuel into the engine. This rocket could be throttled like an airplane engine and was the first such throttleable engine that was "man-rated" or declared safe to operate with a human aboard. Because the X-15 would operate in extremely thin air at high altitudes, conventional mechanisms for controlling the aircraft were not sufficient, and the aircraft was equipped with small rocket engines in its nose for steering. This was the first aircraft to use such a steering method, although it was also in development for the Mercury spacecraft at the same time. The X-15 designers anticipated that their biggest problem would be the intense heat that the aircraft would encounter due to the friction of air over its skin. The upper fuselage would reach temperatures over 460 degrees Fahrenheit (F) (238 degrees Celsius [C]). But other parts of the aircraft would reach temperatures of a whopping 1,230 degrees F (666 degrees C) and the nose would reach a temperature of 1,240 degrees F (671 degrees C). Designers chose to use a high-temperature alloy known as Inconel X, which unlike most materials, remained strong at high temperatures. It was a difficult material to work with. The wings of the X-15 were constructed of Inconel X skins over titanium frames and were bolted to the fuselage instead of being mounted to a main spar as was customary. The X-15 first flew on June 8, 1959, on a glide flight. It was dropped from under the wing of a specially modified B-52 "mothership." The first powered flight took place on September 17. Once the X-15 fell clear of the B-52, pilot Scott Crossfield ignited the rocket engine and flew to a relatively pokey Mach .79. But the X-15 was soon traveling many times the speed of sound. The X-15 continued flying until October 24, 1968, making 199 total flights among three aircraft and establishing many records. During its early years of flight, the X-15 confirmed the hypersonic models developed by U.S. aerodynamicists. These models were later used to design other missiles and spacecraft, such as the Space Shuttle. 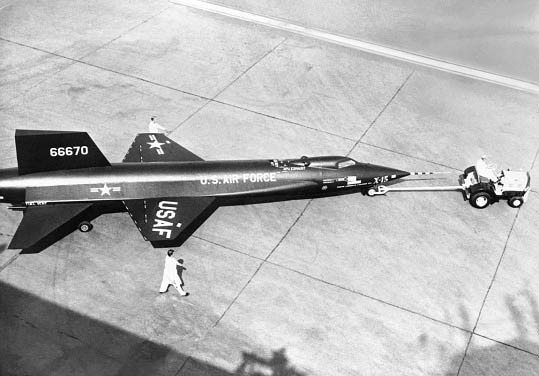 Because of its ability to reach such high speeds and altitudes, the X-15 was a useful test platform for other research experiments. After its initial test flights it began carrying micrometeorite collection pods and ablative heat shield samples for the Apollo program and various other experiments. For approximately the last six years of its operation, the X-15 was not really conducting the missions of an X-plane (expanding the frontiers of flight), but was supporting all kinds of technology programs that required its high speed. The X-15 pioneered the use of various materials for high-speed aircraft and spacecraft, as well as the techniques to construct them. Its rocket engine was also important for the development of later rocket engines, such as the Space Shuttle Main Engine. Inconel X was used for some key parts of the Space Shuttle structure. The X-15 was also the first aircraft to make extensive use of a "man-in-loop" simulator to explore how the aircraft would perform in flight. A pilot would sit in the simulator on the ground and practice his procedures and try to determine what the plane would do when he later flew it. This was a new use for simulators and is now common in all experimental programs. Today, long before an aircraft begins flying, pilots and engineers are using simulators to evaluate its flying characteristics on the ground. The X-15 is widely considered by many aerospace engineers to be the most successful experimental aircraft ever built. Of the two remaining X-15s, one is in the National Air and Space Museum in Washington, D.C., and the other is in the Air Force Museum in Dayton, Ohio.